Alma Acupuncture & Traditional Chinese Medicine is situated in Kilcolgan, Co. Galway. The clinic offers acupuncture and a range of Traditional Chinese Medicine treatments by a qualified practitioner; Vera Deale Lic. Ac., Dip. Tui Na, R.G.N., R.M. Acupuncture is a vital component of Traditional Chinese Medicine and has been used successfully for thousands of years. It is now the most widely used drug free healthcare treatment in the world. It is recognised as a safe treatment by the World Health Organisation. It is also approved by all major Health Insurance companies. Diagnosis is based on the theory of Traditional Chinese Medicine and adopts a holistic approach to treat the root cause of the problem. The principles of Traditional Chinese Medicine are based on promoting the free flow of vital energy known as Qi which circulates the body in established meridians. If there is a blockage or stagnation of Qi in any of the meridians imbalance and ill health arise. 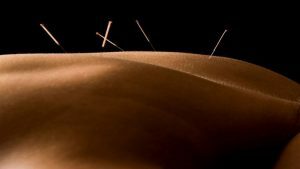 The aim of treatment is to relieve the stagnation by the insertion of very fine needles into selected acupuncture points along the meridians thereby facilitating the body’s own healing. Acupuncture may be used with other elements of Traditional Chinese Medicine such as Chinese Herbal Medicine, Cupping, Moxibustion and Tui Na. Acupuncture may safely be used in conjunction with other prescribed treatments and may enhance the effect of some treatments but you must inform your Acupuncture Practitioner of other concurrent treatments. Chinese Herbal Medicine has also been used for at least two thousand years in China. The herbal formulae treat more than a set of symptoms or a specific illness but they create balance and wellbeing based on a more holistic approach. The formulae are prescribed to suit the individual needs of the patient using natural herbs, the effects of which have been monitored and researched over several hundred years in China. Herbs may be dispensed in tablet, powder or raw herb form. They are a very effective means of treating certain illnesses and may be used as a separate treatment or in conjunction with acupuncture. Serving Galway, Clare, Oranmore, Clarinbridge, Craughwell, Ballindereen, Kinvara, Ardrahan, Loughrea and Gort areas.